Last week I read about a trend in the results from the latest US election on Joey DeVilla’s blog (via HappyPlace, via Fox News, all ultimately via the US Census). 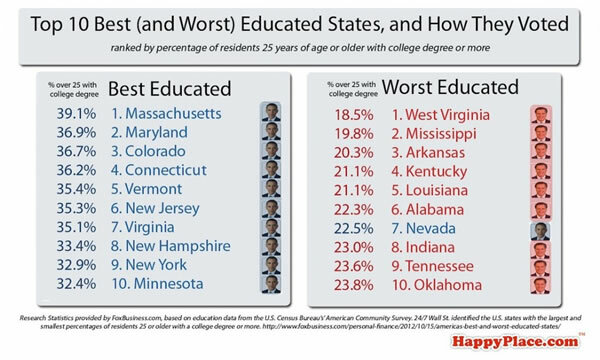 Basically, the ten most educated states (in terms of percentage of college grads) voted Democrat, while nine of the ten least educated states voted Republican. Looks like a trend to me. 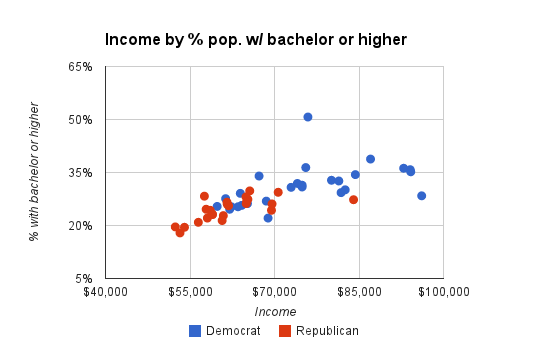 And there’s clearly a correlation between education level and income, so the fact that the bottom end of the trend is virtually all Republican while the top end is virtually all Democrats runs counter to the Republican insinuation that Democrat policies are geared to welfare moochers. Oh, and in case you’re wondering about those outliers, the especially-highly-educated Democrats are in Delaware, and the very-highly-paid Republicans are in Alaska.